We hope you can visit us on stand J68 at this year’s Southern Manufacturing Show where we will be aiming to entertain and inform our customer base both old and new about developments at Inoplas. The show will run over three days and is a little later in the year on 21st, 22nd and 23rd March 2017. Exhibitors include a long list of eminent and emerging UK and international manufacturers and electronics specialists. 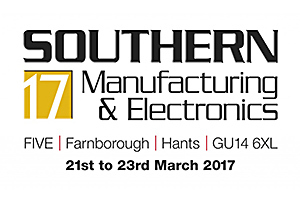 Southern Manufacturing is the UK's largest regional manufacturing technology, electronics and subcontracting exhibition and is held at the FIVE exhibition halls in Farnborough. More details of the show together with an exhibitor list are available at www.industrysouth.co.uk. Please let us know if you would like complimentary tickets to the show and / or to set up a time to meet one of our team to talk about a specific moulding, overmoulding or cable assembly project.